Three decades had passed since their 1987 graduation from a technology high school, but they had remained close throughout life, the marriages, the trips, the jobs, the children. This week, they gathered in the United States for a trip to mark their graduation, some 30 years ago – a celebration that was shattered when a man in a rental truck mowed them down as they rode bicycles on a path on the west side of Manhattan. 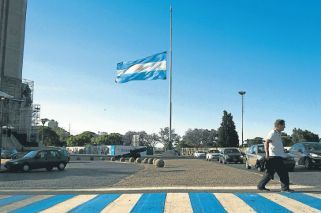 The national flag flies at half-mast in Rosario on Thursday. Foto:Cedoc. It was the 30th anniversary of their graduation. It was a trip to celebrate their friendship. An adventure in the Big Apple for 10 once-rambunctious and now middle-aged Argentines who’d known each other since high school. But the randomness, the callous, cruel nature of terrorism struck them, more than 8,000 kilometres from the country of their birth. Five of those life-long friends died on the New York City bike path that was the scene of a cruel terror attack on Tuesday by an Uzbek immigrant who says he acted on behalf of the Islamic State group. Another one of the group was injured. Eight of the group had travelled from Argentina to meet their two friends in the United States, with stops in New York and Boston. They were classof- 1987 alumni of a prestigious polytechnical school in the northeastern city of Rosario, a school one of its teachers described as so nurturing it was like a home. The men went on to work as architects or businessmen and did well. One of them, Ariel Erlij, the chief executive of Ivanar, an Argentine steel products manufacturing company, had helped some of the others with the plane fare to New York for the weeklong stay. The five who died were identified as Erlij plus Alejandro Damián Pagnucco, Hernán Ferruchi, Hernán Diego Mendoza and Diego Enrique Angelini. Students at the school – formally called the General San Martín Higher Polytechnical Institute – began their day on Wednesday with a minute of silence honouring the victims of the attack, which left a total of eight people dead and 12 injured. The school board decreed five days of mourning with the flag at half-mast. Later that night, the school held a candlelight vigil. “It hurts us to think that people that these are people who walked the same school halls as we did or that studied in our same classrooms,” said Agustín Riccardi, a student at the school. Silvia Goldberg, the mother of a teenage student at the school now, said she was speechless when she saw the news on TV. “I can’t stop thinking that they took the trip to celebrate their friendship,” Goldberg said. Laura Racca, a class of ’87 graduate who once worked with Angelini, a father of four, said the trip these men took illustrated the strong bonds that students form at the polytechnical school. It is public and highly respected, and draws its student body from various socio-economic strata. “You would think that after 30 years they would not even meet for coffee. But no, they would go on vacation together,” said Racca. The truck missed one survivor of the attack, Ariel Benvenuto, by about eight inches. His wife, Cecilia Piedrabuena, said that minutes after the attack she got a call from a number she did not recognise. It was her husband, saying he and two others of the group were OK but the rest were in bad shape. Another of the survivors, Martín Ludovico Marro, was hurt in the attack and is being treated at the Presbyterian Hospital in Manhattan with non-life-threatening injuries. Argentina’s consul in New York, Mateo Estreme, said that Marro – who lives just outside Boston in Newton and was being visited by the group of 10 – saw his friends who survived the attack and his wife on Thursday. He was told five of his high-school classmates had been killed. Marro works for the Novartis Institutes for BioMedical Research in Cambridge, the research unit of Swiss pharmaceutical firm Novartis. Luckily, he is expected to make a full recovery, his family say. Minutes before the attack, Erlij had called his wife in Rosario to tell her he was riding a bike and was happy. “Ariel loved American culture,” said friend Flavia Gauna, who knew of the bike conversation from Erlij’s wife, Pabla Pereyra. “He used to say that if it wasn’t for the US, the world would no longer exist because of these crazy (terrorists). And look what happened.” Erlij’s wife authorised Gauna to disclose details about the victim so he would not become an anonymous terrorism victim, Gauna said. Hernán Diego Mendoza, 47, was a founding partner of the Rosario architecture firm Amascuatro with Benvenuto, who survived the attack. Mendoza was a big sports fan, and a longtime supporter of the Newell’s Old Boys. As a teenager, Mendoza discarded his dream of being a professional soccer player and turned to rugby. He played for the Duendes club and was a coach there until a year ago. He was married with three children. A friend, Cesar Lagostino, who also played at Renato Cesarini, remembers Mendoza for his passion for athletics, and for architecture. “Always a lover of sport and of his profession,” Lagostino said. Alejandro Damián Pagnucco, 49, lived with his wife and three daughters in Funes, a small city in the outskirts of Rosario. After graduating from college, he worked as an architect and later as a salesman for construction materials for Femaco, a company that was owned by the Brayco Group, which was headed by survivor Ivan Brajkovic. “He was very sociable and loved by everyone,” Ignacio Ortiz, a work colleague at Femaco, said. “He was responsible at work and devoted to his family.” It was his first trip to the United States. 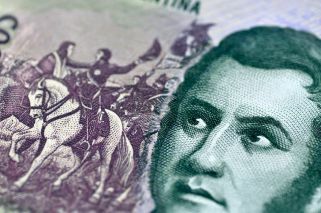 Hernán Ferruchi, 47, was married with two children and had a prolific career at the Fundar construction company, where he held a management post. He was responsible for several projects in Rosario’s affluent north port area, near the Paraná river. His colleagues said he was an excellent professional, as well as a humble, loving man. Diego Enrique Angelini, 48, followed in the footsteps of his father to become a well-known architect in Rosario and ran the architecture studio Angelini Architects. Angelini was married and had four young children, local news reports said. “He was a very good professional and person. He was noble, loved by the city. It’s so hard for us that he’s gone,” his father, Luis Angelini, said. 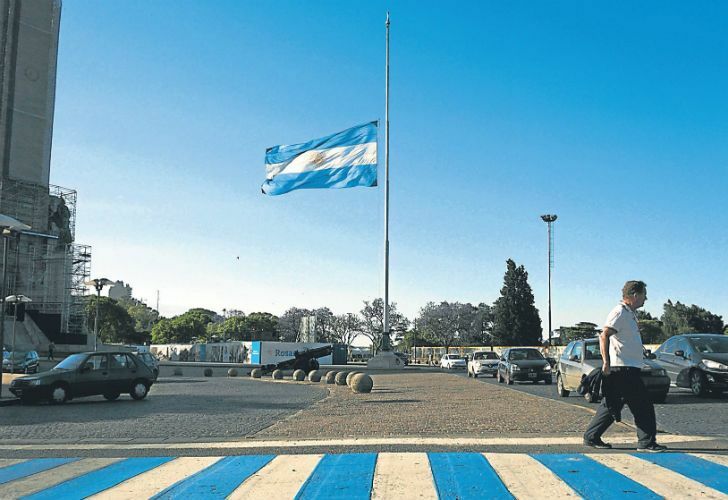 President Mauricio Macri said Wednesday that the attack, which killed eight people overall and seriously injured 11, “hit all Argentines hard,” adding that “there’s no place for grey areas” and that everyone must be committed from “head to toe” in the fight against terrorism. “Five of the victims were from Rosario — young entrepreneurs, members of the city’s society. I imagine they had beautiful families,” Macri said during a public event in Buenos Aires. Trump upped the rhetoric on Thursday, calling for the man charged over the attack to be executed, as the Islamic State jihadist group described him as one of its “soldiers.” Trump had said he was considering sending Sayfullo Saipov, 29, to the notorious Guantánamo Bay detention centre, but backed off the idea in a blast of tweets calling for the death penalty. Saipov is now in a detention facility on terrorism charges. A charging document said the Uber driver and fatherof- three, who emigrated in March 2010, confessed to acting in the name of the Islamic State (IS) group and “felt good about what he had done,” even demanding to hang the jihadist organisation’s flag in his hospital room. Trump said Thursday he was “starting the process of terminating” the popular green card lottery, which he said had enabled Saipov to enter the country, as the White House moved to use the attack politically. New Yorkers, however, preferred to pay tribute to the victims. On Thursday, the Manhattan cycle path where the attack took place reopened, as New Yorkers and tourists flocked back to the much-loved spot to reject fear. Floral tributes were laid, honouring the 20 victims, the eight who died and the 12 who were injured. “We are stronger,” was chalked into the ground. Next to it, an Argentina national team football shirt was hanging, in tribute to those five late friends, who were with each other until the end.